My penpal group has some pretty awesome swaps now and again. Actually, I enjoy ALL of the swaps throughout the month that the League of Extraordinary Penpals (LEP) does. This month was no different. I got to send a package to Brandi, up north (still in California) and she sent me a bunch of goodies in reply. 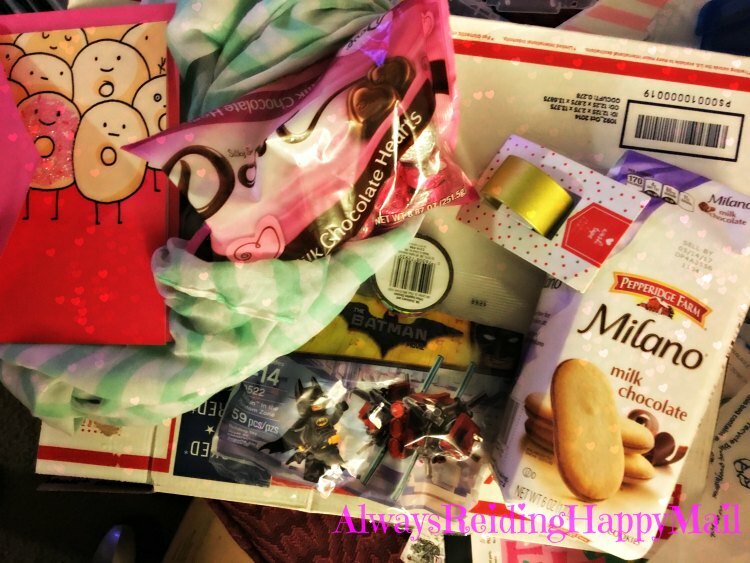 The picture is above–some dove hearts (I love these, so I can’t bring myself to open them just yet), Milano cookies (which I am bringing in to share at work), a scarf, two rolls of washi tape (I LOVE this stuff) AND a lego Batman set. Funny story, I was going to go to the 3D Imax viewing of that movie in order to get that kit, but since I have this now, we can just see the regular version of the movie–YAY!!!! Have you gotten any happy mail to share recently? Please share in reply!